Anniville Equipment Company is ready to get you the exact piece of equipment to suit your needs and budget. 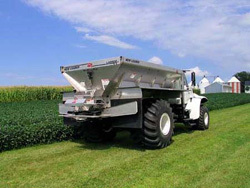 The L3020G4 sets the standard for spinner spreaders. 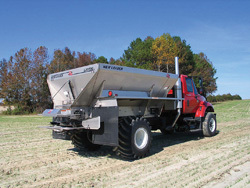 What makes the New Leader spreader so effective is its patented G4 variable rate broadcaster. The fixed material divider and adjustable fan assembly allow the dished spinners to spread material farther, wider and more consistently in hanging weather conditions. 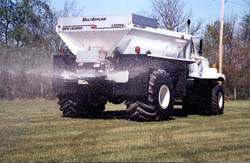 The L3020G4 consistently applies up to 105 foot spread patterns with fertilizer. The L3020G4 lets you cover more acres per day with wider, more effective swath widths. 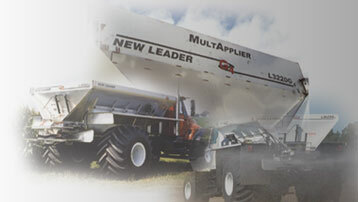 Reduce the need and cost to blend fertilizer with the New Leader MultApplier. The L3220G4 with the MultApplier insert is a two-bin system with independent conveyors that allow you to imultaneously apply two products at pre-determined rates. The main hopper has all of the features of the popular L3020G4 and can be used for single or dual product application. This unique feature eliminates product separation that typically occurs as you are driving across the field. The New L4000G4 fertilizer and lime spreader provides modular hydraulic packages to suit your spreading needs.Plus you may add a second or third bin at any time for spreading up to three variable rate applications in one pass. This allows you to get the job done more accurately and in less time.